This wedding photo was taken at the Hallmark Hotel in Handforth, near Manchester. We had a bit of time when Amy and Mark had first arrived at the venue to get some shots while they were sipping their bubbly. I wanted to use a wide angle lens to get the full car in the shot. I was keen to capture them in a natural relaxed pose, without me giving any directions. I was also trying to keep low, to make sure the car was obscuring any other cars behind. It was the third vehicle that Amy had travelled in that day! 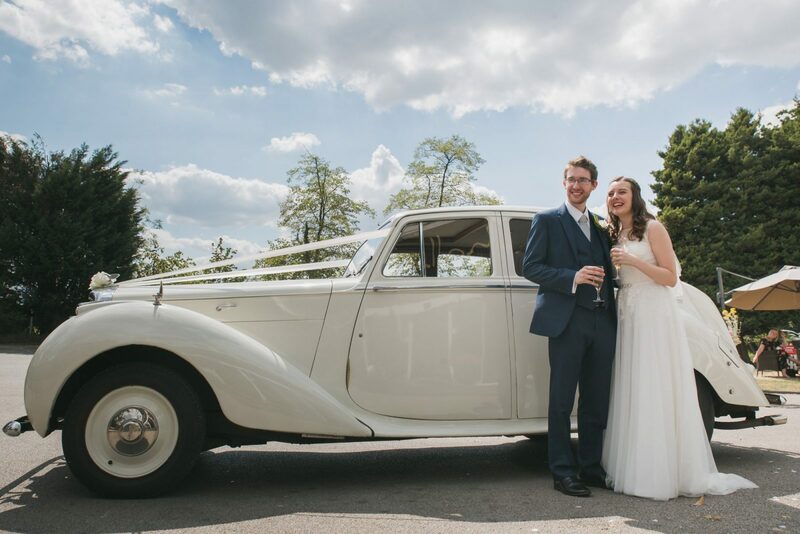 The first wedding car had broken down, so Amy was driven to the wedding in her dad’s convertible, complete with hastily-tied ribbons on the bonnet. The replacement car arrived during the service so this was how they left the ceremony!